Add embroidered artwork from our Design Library. I understand that the estimated production time for this item is approximately 30-45 business days and it cannot be rushed. 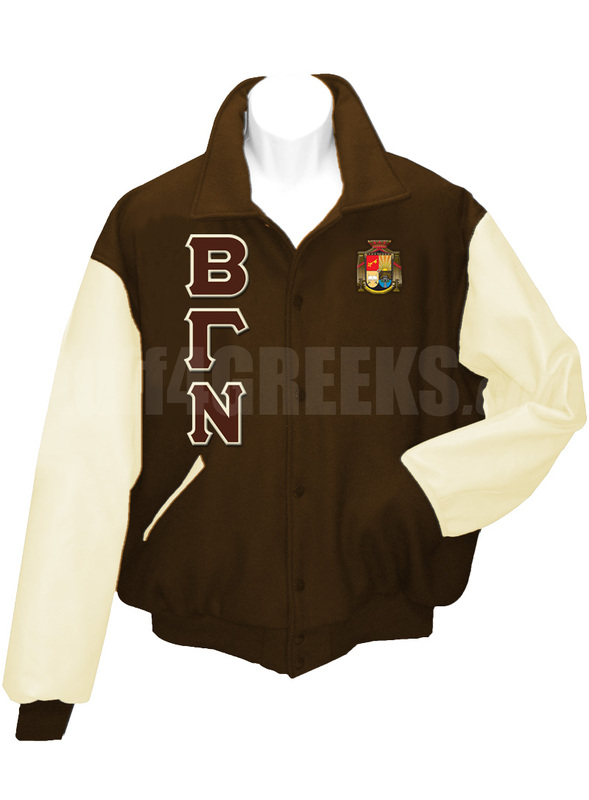 Brown Beta Gamma Nu Letterman Varsity Jacket with cream sleeves, the Greek letters down the right, and the crest on the left breast. Don't like this Letterman jacket? Looking for something different? Click here to make your own custom Greek Varsity jacket. You will earn at least 350 rewards points for this purchase. Your total rewards points will be higher based on the options and quantities that you choose. Your merchandise total at checkout is your true rewards value.